Relax rebel heroes, the secret plans are safe in the hands of a teenage moisture farmer who doesn’t know he’s Darth Vader’s son. 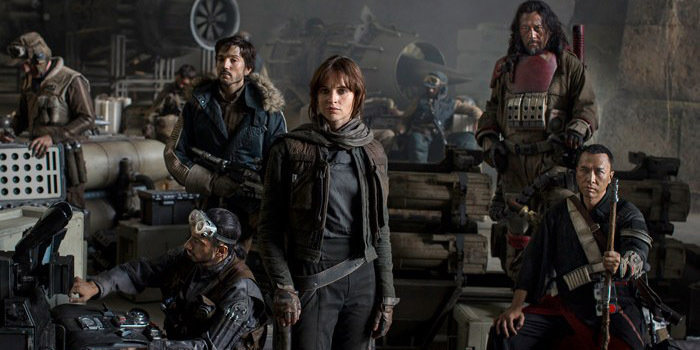 Rogue One feels like a heroine’s journey has been extracted from something originally conceived for an ensemble cast, leaving us with not quite enough of either. There are too many characters, talking so much about what they’re doing we don’t know what they’re doing. Shutup! And that wisecracking robot sounds like somebody thought it’d be funny to turn a script editor’s sarky margin notes into dialogue (and to be fair, it sometimes is). Mads Mikkelsen cast against type as Kindly Dad worked. Ben Mendelsohn cast against type as Ambitious Unter-Nazi Bite Dog didn’t work. Note to selves everywhere; don’t put Ben Mendelsohn in a uniform, or make him talk posh. The director seems a little overcome by the visual effects responsibilities a Star Wars gig brings with it. Not everybody thrives with an unlimited palette. Just because visual effects mean you can do anything doesn’t mean you can just do anything. As for Grand Moff Tarkin, CG thespians seem to have achieved a new benchmark, now roughly parallel with the work of Madame Tussaud. It seems the higher you climb out of the uncanny valley, the harder you fall. As for Leia, oh my. Meanwhile the major battle scene is nicely put together, though with a massive nod to Charlie’s Point (sans valkyries). And finally, Villeneuve does deliver a smattering of the most beautiful shots ever seen in a Star Wars movie. Perhaps he’d rather be shooting Baraka in a galaxy far, far away. Somebody, maybe not Denis Villeneuve, has resorted to a tribute to Seven Samurai to wind up this tale of martyrdom. Further, theme-wise, Rogue One has lost control of the force. Sure it was a black and white morality but the point was you could find yourself slipping across the line at any moment. No one here is doing that.